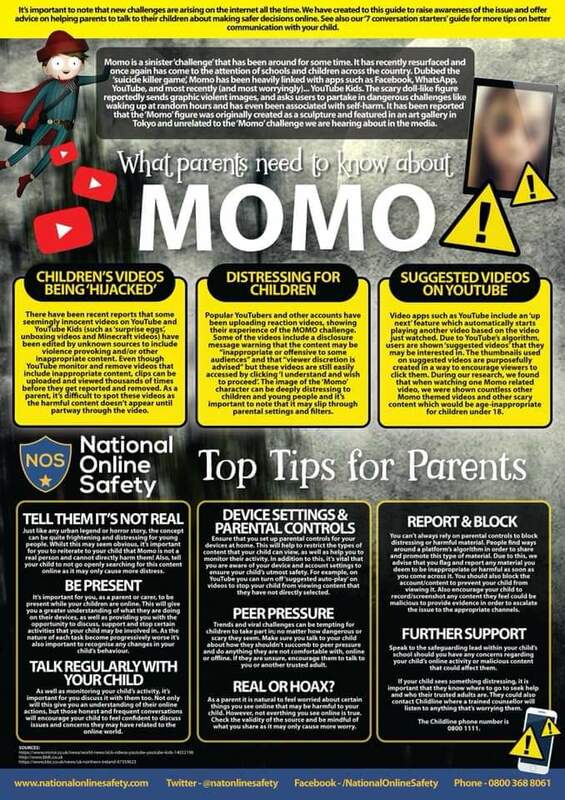 The pages have been written specifically for children to access if they have questions about staying safe online and include top tips, videos and short quizzes. This also makes them a fantastic resource for parents to use with their children to help support their family’s internet use. What should I do if someone online is mean to me? What should I do if an online friend wants to meet up? How much time should I spend online? What does the report button do? What do I need to know about sharing things online? What makes a good online friend? How old do I need to be to access social media? MOMO CHALLENGE - Coined the 'suicide challenge', a new viral game dangerous to children. Parents Be Internet Aware – Check what APPS/Games your child is using and how to securely manage them.